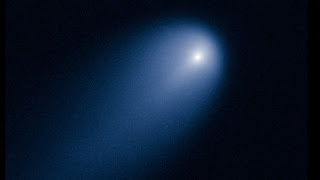 Space scientists are fanatically tracking a recently discovered comet that is streaking toward the sun, waiting to see if it will live up to its hype as a possible "Comet of the Century." Comet ISON began its journey about 10,000 years ago when it left our solar system and started its peril-fraught approach to the sun, according to NASA. On Nov. 28, it will make its closest pass to the sun — within about 680,000 miles from the stellar surface, according to Zolt Levay, imaging team lead at NASA's Space Telescope Science Institute. If the comet survives, it could emerge glowing as brightly as the moon, visible to the naked eye, creating a spectacular sky-watching show for us on Earth, NASA says.